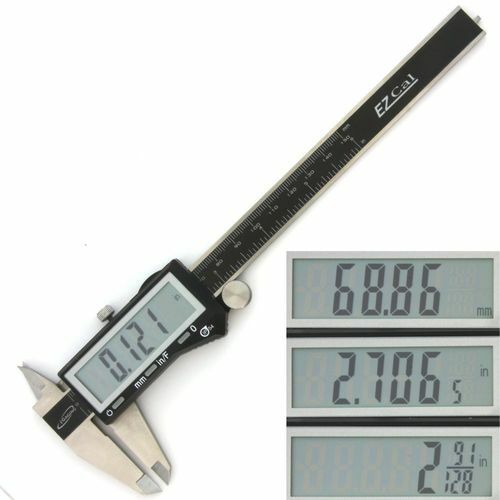 Simply put, comparing this against my known good Neiko 01412A Pro-Quality Digital Caliper with LCD Screen and Standard/Metric/Fraction Conversion, Stainless Steel 6” caliper (as verified against a mess of higher end known good calipers and standards). The Pittsburgh caliper will measure within .001”, however that is where it fluctuates, so your measurements will be +/- .001”. Now mind you, we are working with wood, not machining metal racing engine parts, so the tolerances here should be perfectly acceptable to all but the most fine scale woodworkers. The fit and finish of my particular caliper is a couple of steps below the Neiko unit I have been using for several years. I had heard many good reviews on the Pittsburgh unit so I felt it was worth a gamble, especially since I have gotten plenty of decent workable tools from HF, but this particular instrument is simply put, a disappointment. So due to some of the responses I got here, I tried something, working the caliper back and forth across the rails repeatedly for about 5 minutes, sort of letting metal hone metal kind of thing. The result? Zero is zero, .001 is no longer +/- .001 but actually .001. It now matches the Neiko caliper. All told, from what I am seeing it is accurate after some wear to the rough slide surfaces. Not sure what that means to long term durability, but for my uses it will be more than adequate. Now, in some ways, I like the Pittsburgh better than my Neiko, for starters, it has an SAE fractional setting the Neiko lacks, the battery seems to be the same size, which is good, I can buy a multi pack and call it good! Honestly the Pittsburgh looks to be in many aspects just a lower grade fit and finish wise from the Neiko, and again, with the rails worked back and forth, whatever was causing the fluctuation is GONE. Igaging makes a good one too. A nice tool to use and astonishingly consistent. Very affordable as well. No gaps between the contact tips when closed, and everything was machined very nicely. I have two three digital calipers. My oldest is a Wixey, heavily used, and a little touchy now. The on/off button is finicky lately. But it does go to 4 digits, and does fractions. I think it has been in the shop for nearly 6 years. The head is made partially of plastic, but the rest is nicely machined metal. I am not really complaining about the Wixey, because I use a calipers frequently, and it performed well for years. For my La Conner shop, I bought a General Instruments Ultra-tech. Probably at Lowe’s, but it could have been the Grizzly showroom in Bellingham. Other than the head, it is very similar to the Wixey. The head is all metal with excellent fit and finish. In all respects it feels, looks, and functions like good quality. So to replace the Wixey in my shop in Anchorage, I bought another General. At this point, I use the General most of the time. Occasionally the Wixey still gets used….....but the on/off button has become an annoyance…......probably representing inevitable wearing out of the device. The General should be readily available at Lowe’s, possibly HD, or other hardware stores. I have an old, plastic, but well constructed Swiss mechanical calipers. It is not used much any more, but is a good reference device. I have some Igaging digital tools as well. The height gage is particularly nice and useful. I have Wixey angle gages that have functioned well over time. The Wixey devices tend to eat batteries in their sleep, so I keep a bunch of 2032 batteries at both shops. In summary, take a look at the General brand that should be available locally. Their digital calipers seems to be a cut above the rest. Speaking of precision, I find that if everything is going well in the shop I can maintain about 1/500 of an inch variance, and that is =/- 0.002. But the wood has to be nearly perfect to start with, and the machines have to be in recent accurate calibration. +/- 0.01 is more common, and let’s face it, +/- 1/64 or about +/- 0.016 is usually adequate. That is 8 times worse than the best I can do, however. I am not sure, but if you are talking about General Tools, the yellow and black package people, I would be a bit shocked if they made a truly great tool. Most of their stuff I have used over the years is on par or a shave below Harbor Freight. The General doweling jig and pocket hole jig I had were usable, but quirky. I gave them to Pastor Steve before he passed on from cancer. I bet he’s upstairs in the great wood shop now! I have the Pittsburgh (HF) 6” digital caliper. I have compared readings I got with the HF caliper with Starrett and Mitutoyo vernier calipers and micrometers and they are spot on. Maybe I’m just plain lucky. Yup, that General. I think I detect some upgrading of their product line over time. They were exactly like you describe, but I think they have changed their strategy. It is a little like the Ryobi and Rigid lines at HD. They have obviously put quality much higher on the list of priorities, and are making some excellent products. I recently bought a set of Ryobi driver bits that are actually a cut above most of the competition. Ditto on their quick change drill bit set. I purchased the drill bit set for my La Conner shop, and liked it so much, I bought one for Anchorage as well. And I bought the driver bit set as well for my recently posted driver tote. If the General digital calipers is any indication, then General needs to be included in a preferred brand group. Frankly, I was surprised at the quality after I bought the first one. It is one more illustration of the unfortunate rapidly changing brand/quality equation in the woodworking realm. Brands we thought were good have deteriorated, and the also-rans have become better. There are no simple answers for the average amateur woodworking bloke. Thnx for your review, and the link on Amazon. These are handy, but the batteries don’t seem to last too long. As you stated, fluctuations of +/-.001 are OK for woodworking. There are a lot of other ones out there that are acually worse and are typically made entirely out of plastic. I own five calipers three 6” (one digital, one dial, and one U.S./metric vernier) one 18” vernier, and one 26” vernier. I use the dial/vernier ones the most because I don’t like to replace batteries. I have heard so many good things about the Pittsburgh 6” digital calipers that I had to try one on for size, and since it is pretty fresh out of the box, it is likely that there really isn’t much wrong with it, it just jumps .001” from zero when setting it, could just be slightly rough machining that will polish in over time…. I found that tightening up the screws slightly that clamp the movable jaw to the bar, improves the accuracy. I also wipe the faces of the jaws before using, as just a tiny pinch of dust can throw the reading off a thos or two. Pittsburgh, SE, Neiko, they are all the same with varying levels of quality control. The iGaging IP54 that Pinto mentions is probably as good a caliper you can buy new for less than $50. You can get Mitutoyo’s in the $80-100 range new. The HF stuff is what it is, made as cheaply as possible and with bare minimum quality control. You might get a good one, you might not. I’m almost 60 years old, and have never owned a caliper in my life. I’ve always tinkered with woodworking around the house, but never had a dedicated shop until recently. I was at a HF tent sale about a year ago, and they had these digital calipers at a really low price, so I bought one just because it was on sale. I have been astounded by the number of times I’ve used this little gem since I’ve had it. Now I don’t know what I would do with out it.